The horse-shoe shaped beach at Arenal d en Castell, on the north coast of Menorca, is perfect for families, with its fine, soft sand and gentle shallows. The beach is only 550m from the Sa Miranda Apartments (along a path or via steps). We booked a last minute deal and hot footed back home to look on the net to see where we had booked.It looked good but after reading the reviews we were more than a little worried as it didn't sound to good. On arrival it looked very nice and got better from there on in,to be honest if you are looking for five star accommodation and paying for two you will be disappointed.It was as described in the brochure,it was quite big for the four of us although the room with the bunk beds was a little on the small side but then just how much time do you plan on spending there so we were pleased. The kitchen was very well stocked with plates, dishes,cups,pots and pans and utensils,it had a two ring cooker a small oven which we used to warm bread and cook the sausages.A large fridge,kettle and three power points. The apartment has free air con which helped us sleep but was to cold for me.the maid service was every three days and they were very pleasant. We were at the back of the resort but no more than a four minuet walk from the beach and a seven to the centre.Our position made it nice and quiet as we were in a one way system the only traffic was the local bus which stopped at nine. The pool was brill spotless and a snack bar two pool tables and air hockey for the kids too,the water felt cold when you jumped in but it was because we were so hot [thirty nine degrees at ten thirty in the morning] once in it was like warm bath water and the view was fantastic.I looked at a lot of pools while I was there and found ours to be the best in terms of location,most were surrounded by the complex on all sides ours had apartments to one side the bar to another the sea and open bushland to the others. The entertainment is at the sister hotel two min's down the road which is brill the four tops,acrobats. Our complex was the only one that was fully booked and we are already talking to the travel agent to rebook for next year. Firstly, the apartment was just as it was stated in the brochure. The rooms were clean, the room where the bunk beds were was very small, not nearly as big as two adults were expected to sleep. But saying that we managed. The bathroom was small, but how big do you need a bathroom to be? I think the biggest problem was noise from furniture being moved in the apartments, with a tiled floor it is inevitable that noise comes with movement of every piece of furniture moved. We found the kitchen was fine, although the cooker only had two electric rings, we cooked full curries and other meals with no problems at all, as well as full English breakfasts every day! The only real problem was that there were no apartments with two double beds as all apartments were identical. As an afterthought the pool and bar area surrounding it was really good, although the pool itself was freezing. The staff seemed pleasant, but we never went to the meeting so made all our own arrangements. As a family of 5, we found the apartment to be extremely small, particularly the bathroom - you had to stand in the bath to shower the little ones. It also smelled quite damp. The 'kitchen' area was also very small, two electric rings, a very mini oven and no food preparation space. The only good thing was that we had a full sized fridge. We were also not informed that the fifth bed was in fact a sofa bed in the lounge, only suitable for a child up to the age of 12 years, so that meant that once the kids had gone to bed, there was no adult time, couldn't really sit on the balcony as this was again really small. There was also not enough storage space for the amount of clothing needed for a family of 5 for two weeks - no drawers at all. Our room was situated at the back of the complex, and we were woken every morning, between 2.30am and 4.30am by the emptying of the large dustbins and the bottle bank. We did complain, and to the credit of the receptionists, she did telephone the council(?) immediately, to no avail - it continued. This along with the fact that there was very loud music every night (did stop at midnight) meant that we did not get a lot of sleep. We did hire a fan for the room, but to be honest, it didn't make a lot of difference, the heat and humidity was stifling. The entertainment schedule was full, throughout the day and in the evenings, although I was disappointed that the kids club ran different sessions, so no kid free time! The on site restaurant was very sparse and basic, but the menu was o.k. and all the staff were helpful, friendly and polite. I cannot find fault with any of the staff, from the English receptionists, to the spanish maids, to the Thomson reps - all were extremely helpful and friendly. The pool area was o.k., did get very busy, and there were not enough parasols to go round, and the floor gets Extremely hot! Much preferred going to the beautiful beach, about a five minute walk from the apartments, quite hilly, so if you have a pushchair, or mobility problems, this could make it a bit difficult. The room was cleaned every other day, with change of linen and towels. We would not visit this complex again. 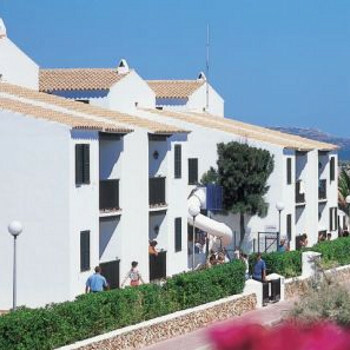 Having stayed in a superfamily Talayot Apts (Cala'n Forcat) last year we were pleased to find the Sa Mirada spotless. The kitchen was compact but we never used it-always ate out. The lounge and bedrooms were reasonable but the bathroom was rather compact. There are there floors to each complex ( 3 complexes).The ground floor appts open out onto a large lawned area absolutely brilliant for the chldren to play in early in the morning and whilst the adults got ready for the evening. The whole complex is gated so you knew your children were safe. There are two play areas . The entertainment in the evening is exellent both by the professionals and the reps. I strongly suggest you participate and attend most evenings as it hightens the enjoyment and you make good friends and the atmostphere was brilliant. There is no laundrette currently but there are plans to install one- if you're desparate the Hotel offer to wash one large bag on a cold wash for 12 Euros. The towels are changed every three days but on day three we were getting a little desparate- I suggest youn pack a few of your own showere towels and use the Thomnson bech towels on the loungers during the day. My kids virtually grew up here, we holidayed here for seven years in a row, but that was until now. The owner Luis sold the establishment to a rival and boy did it go right downhill with a bang! The bar staff were less than professsional and the food to use a scottish expression would give you the "boak". The beer and wine was warm and the staff were bereft of personality. My daughter didn't drink the coke that she always loved, as it had been watered down too much. The Sa Mirada is very much a place that's located on the extremities of a very beautiful horse shoe cove, so to appreciate it's beauty, everything has got to be right and for us there are too many wrongs. We bid sad fairwell to Arenal and it's lovely beach and locals but we won't be back to the Sa Mirada. 1/10. I'd checked this site before going to Arenal, so was quite hopeful that I was in for a good holiday. Well we had a FANTASTIC holiday!! This was our first holiday abroad with our two boys, aged 7 & 4, so we wanted something that would make our lives easy by ensuring they had plenty o do. We couldn't have asked for better. The Reps at the Sa Mirada were outstanding, there were always things to do around the pool by day, and at the restaurant area by evening. The kids enjoyed the kids clubs, though I was a little suprised at the lack of places in them, compared to the amount of kids at the complex. The evening clubs for the kids were a godsend (you are charged 2 euros per child for this) but it meant that the adults could enjoy the restaurants of the resort without having to find a menu catering for 'chicken nuggets & chips'. Just returned from the Sa Mirada Apartments - we had a fantastic holiday. It is the first time we have taken the children abroad and they loved it. The Thomson Reps are brilliant and the reception staff at the Sa Mirada Apartments are very friendly and helpful. The pool is lovely and clean and you can clearly see the children from all around the pool - my children loved the pool and so did we! The apartment was nice but basic. The sleeping arrangements for 5 were not ideal - a bit too small. We also struggled with the hot water - not enough hot water to shower 5 at a time when returning from the beach. The cooking arrangements were very poor - the oven was very tiny. We had cereals and croissants for breakfast and ate dinner and tea out every day for our 11 night stay which was very expensive. There are some nice restaurants in the resort, one of our personal favourites was Sa Gavina where the food was excellent and the service fantastic (a bit pricy but worth it. The resort was lovely, plenty of entertainment at night around the resort - ideal for families, most finish around 10.30pm. The beach is beautiful and the sea has lovely clear water - the only downside to the beaches all over Menorca is the charge for sunbeds - around 18 Euros for 2 sunbeds.